↑ The ancient tradition is attested in Pausanias, 1.22.8; for a modern denial, see Kleine Pauly, "Sokrates" 7; the tradition is a confusion with the sculptor, Socrates of Thebes, mentioned in Pausanias 9.25.3, a contemporary of Pindar. ↑ Trans. based on Gomme, Commentary on Thucydides 2.384. Bruell, C. (1994). 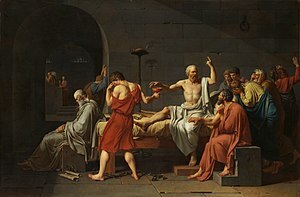 “On Plato’s Political Philosophy,” Review of Politics, 56: 261-82. Robinson, R. (1953). Ch. 2: "Elenchus", Plato's Earlier Dialectic, 2nd edition (Clarendon Press, Oxford). Robinson, R. (1953). Ch. 3: "Elenchus: Direct and Indirect," Plato's Earlier Dialectic, 2nd edition (Clarendon Press, Oxford). G.M.A Grube,(2002). " Plato, Five Dialogues". Hackett Publishing Company, Inc.
Apology of Socrates, by Plato.